A landfill? a sewage treatment plant? a cemetery? Where are you taking me? Birding is often best in the least likely places. At sewage treatment plants, watch for ducks and gulls - and raptors keeping watch over them all. Another place might be your local landfill or dump. The Brownsville, Texas dump was, for years, the only place in the US you could find this Tamaulipas Crow. For a more sedate birding adventure, visit a cemetery. Especially in rural areas and in the Midwest, cemeteries are often repositories of native plants, and thus magnets for migratory birds, which find food - and cover - in those green oases. Location is just as important in birding as in real estate. But unlike real estate, where the prime location has a panoramic view or great ambience, birding is often best in the most unlikely places. For a more sedate birding adventure, visit a cemetery. [Soft twittering of a House Finch] Especially in rural areas and in the Midwest, cemeteries are often repositories of native plants, remnants of the native habitats of the 19th century. They’re magnets for migratory birds, which find food—and cover—in those green oases. They’re quiet, too. Bird audio provided by The Macaulay Library at the Cornell Lab of Ornithology, Ithaca, New York. Glaucous-winged Gulls recorded by A.A. Allen. Common Raven calls recorded by R.S. Little. 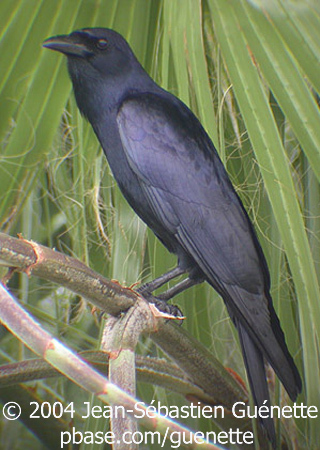 Tamaulipas Crow recorded by L. Irby Davis. Song of the House Finch recorded by G.A. Keller.